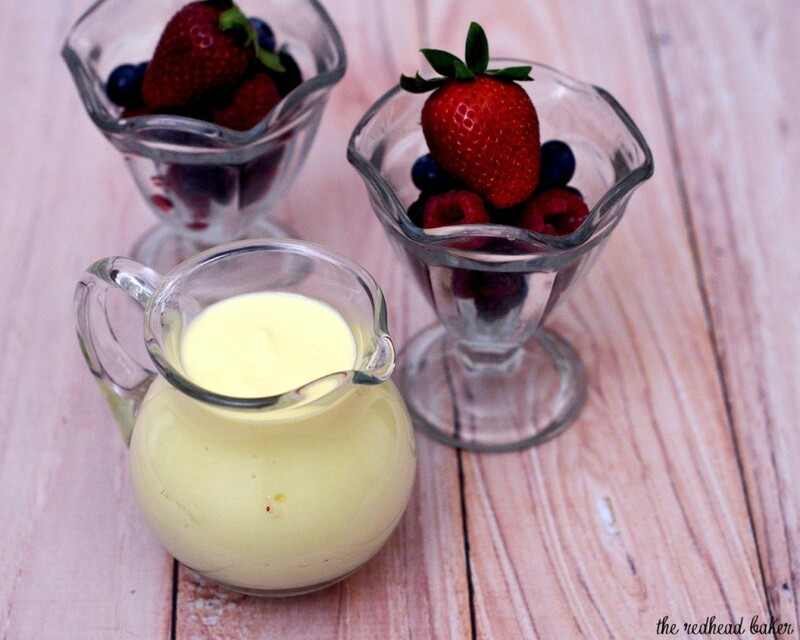 Creme anglaise is a classic French recipe for vanilla sauce. This versatile sauce is an egg yolk-based, stove-top cooked custard. Use it to top any number of desserts, or churn it into ice cream! Happy Sunday, readers! Welcome to this week’s Sunday Supper Egg-stravaganza! Yes, today’s recipes are all egg-based. 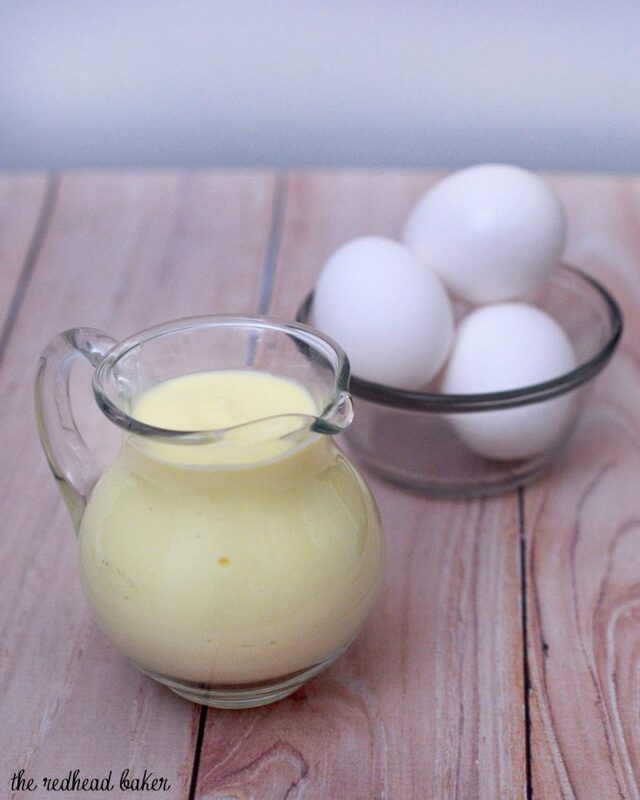 My recipe is a stove-top custard thickened with egg yolks called creme anglaise. It’s a classic French recipe that all culinary students are expected to master. I’ve made it so many times, I don’t even need to reference a recipe anymore. 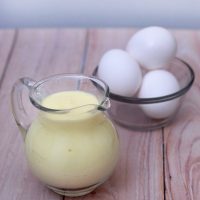 Creme anglaise is thinner than what you typically picture as custard. It’s thicker than cream, but thinner than pudding. 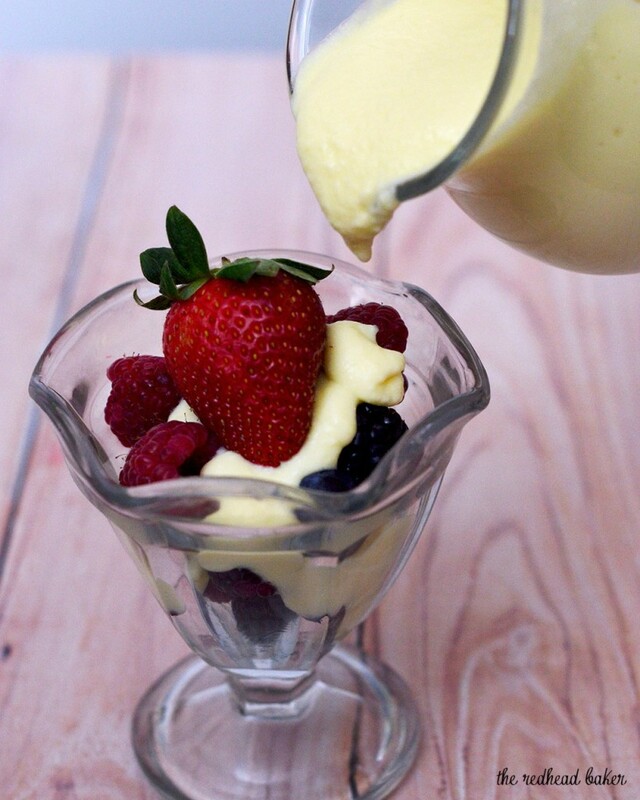 If you’ve ever made ice cream, you’ve already made creme anglaise. You could take this recipe, chill it, then churn it, and you’d have vanilla ice cream. A couple of tips: have all of your ingredients prepped and ready to go before you start. You don’t want to leave dairy on the stove unattended, or it can bubble over quickly and make a HUGE mess. Don’t mix the sugar and egg yolks ahead of time. Sugar is hygroscopic, which means it will absorb water from the egg yolk if the two sit undisturbed for too long. The egg yolks will coagulate, and there’s no reversing that once it happens. You’ll need to start over. How will you know when your custard is done? Grab a wooden spoon and swirl it through your custard, then flip it over so the bowl portion is up. Swipe your finger horizontally across the custard. If the custard does not run down into the void where your finger swiped, it’s finished. If you cook it too long, the egg proteins will cook, leaving you with little lumps of scrambled egg yolk. If that happens, pour your custard through a fine-mesh sieve before cooling to room temperature. 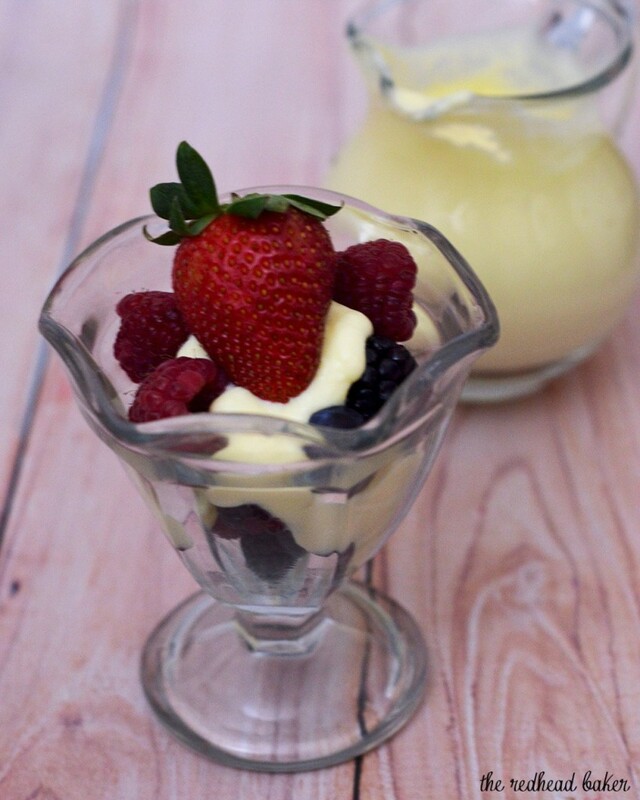 So, what can you do with creme anglaise? Aside from churning it into ice cream, you can pour it over pie, cake, or a bowl of fruit. You can also flavor it with cinnamon or other spices or herbs, chocolate, liqueur, or coffee. Or do what I do, and just it from a bowl with a spoon. Combine milk and cream in heavy medium saucepan over medium heat. Bring milk mixture to simmer. Remove from the heat. In a medium mixing bowl, vigorously whisk the egg yolks and sugar until thickened and light in color. Gradually whisk a quarter of the hot milk mixture into yolk mixture. Return the yolk/milk mixture back to the saucepan. Stir with a wooden spoon over low heat until custard thickens, about 5 minutes. Do not allow the custard to boil. Strain the sauce through a fine-mesh sieve into a bowl, then stir in vanilla extract. Press a piece of plastic wrap directly on the surface of the custard and cool to room temperature, then chill in the refrigerator. Don’t forget to check out more #SundaySupper Eggtastic Recipes! I had no idea what creme anglaise was but they always talk about it on cookign shows. Glad to finally know what it is! I must try it. Great prep tips! I need to try it this way real soon! I love creme anglaise. I strain it every single time for a velvety texture. Perfect with fresh fruit, as you have done here! Great tips! I might actually be able to make this now! Thank you! Love the tips! Sounds perfect with berries. I particularly love it with walnut cake. Unfortunately this recipe does not tell you when to add the vanilla. I added it to a PERFECT custard at the end of cooking and the custard immediately turned into a thousand lumps. I rescued it by running it in a food processor and then heating with a little cornstarch/milk mixture. You might want to fix this error. Step 3 says when to add vanilla.